Rewards Canada: July 14 Update: BMO CashBack World Elite earn rate dropping to 1.5%, wait to apply for the SPG Amex & more! July 14 Update: BMO CashBack World Elite earn rate dropping to 1.5%, wait to apply for the SPG Amex & more! 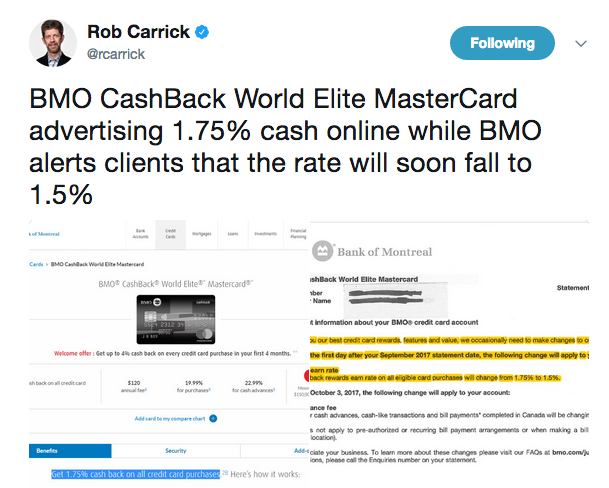 Via Rob Carrick, the BMO CashBack World Elite MasterCard will be dropping its everyday earn rate of 1.75% to 1.5% on October 3rd. The card that ranked 4th overall in our 2017 Top Cash Back Credit Card rankings is likely going to lose that spot in our next rankings as TD has come out with new Cash Back cards (to be covered here on Rewards Canada shortly) and existing cards that offer a similar return to the BMO card's new earn rate. Despite a couple great new sign up offers on some of their other cards BMO really seems to be losing ground in the rewards card market compared to other issuers and with changes likes this they aren't doing anything to gain any ground back. If your were thinking of applying for the Starwood Preferred Guest Credit Card from American Express this weekend, wait. Wait until the 18th, you won't be disappointed.